Was Barack Obama a Muslim? "If I were a Muslim I would let you know," Barack Obama has said, and I believe him. In fact, he is a practicing Christian, a member of the Trinity United Church of Christ. He is not now a Muslim. But was he ever a Muslim or seen by others as a Muslim? More precisely, might Muslims consider him a murtadd (apostate), that is, a Muslim who converted to another religion and, therefore, someone whose blood may be shed? 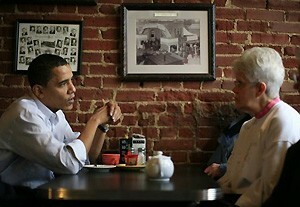 Barack Obama at the Smoky Row Coffee Shop in Oskaloosa, Iowa. My father was from Kenya, and a lot of people in his village were Muslim. He didn't practice Islam. Truth is he wasn't very religious. He met my mother. My mother was a Christian from Kansas, and they married and then divorced. I was raised by my mother. So, I've always been a Christian. The only connection I've had to Islam is that my grandfather on my father's side came from that country. But I've never practiced Islam. ... For a while, I lived in Indonesia because my mother was teaching there. And that's a Muslim country. And I went to school. But I didn't practice. But what I do think it does is it gives me insight into how these folks think, and part of how I think we can create a better relationship with the Middle East and that would help make us safer is if we can understand how they think about issues. These statements raise two questions: What is Obama's true connection to Islam and what implications might this have for an Obama presidency? Was Obama Ever a Muslim? "I've always been a Christian," said Obama, focusing on his own personal lack of practice of Islam as a child to deny any connection to Islam. But Muslims do not see practice as key. For them, that he was born to a line of Muslim males makes him born a Muslim. Further, all children born with an Arabic name based on the H-S-N trilateral root (Hussein, Hassan, and others) can be assumed to be Muslim, so they will understand Obama's full name, Barack Hussein Obama, to proclaim him a born Muslim. Obama's mother, divorced from Obama's father, married a man from Indonesia named Lolo Soetoro, and the family relocated to the country from 1967-71. At first, Obama attended the Catholic school, Fransiskus Assisis, where documents showed he enrolled as a Muslim, the religion of his stepfather. The document required that each student choose one of five state-sanctioned religions when registering – Muslim, Hindu, Buddhist, Catholic or Protestant. he wasn't sure why the document had Obama listed as a Muslim. "Senator Obama has never been a Muslim." His former Roman Catholic and Muslim teachers, along with two people who were identified by Obama's grade-school teacher as childhood friends, say Obama was registered by his family as a Muslim at both schools he attended. That registration meant that during the third and fourth grades, Obama learned about Islam for two hours each week in religion class. The childhood friends say Obama sometimes went to Friday prayers at the local mosque. "We prayed but not really seriously, just following actions done by older people in the mosque. But as kids, we loved to meet our friends and went to the mosque together and played," said Zulfin Adi. ... Obama's younger sister, Maya Soetoro, said in a statement released by the campaign that the family attended the mosque only "for big communal events," not every Friday. Recalling Obama's time in Indonesia, the Times account contains quotes that Obama "went to the mosque," and that he "was Muslim." Summarized, available evidence suggests Obama was born a Muslim to a non-practicing Muslim father and for some years had a reasonably Muslim upbringing under the auspices of his Indonesian step-father. At some point in his late twenties, he converted to Christianity. It appears false to state, as Obama does, "I've always been a Christian" and "I've never practiced Islam." The campaign appears to be either ignorant or fabricating when it states that "Obama never prayed in a mosque." Obama's conversion to another faith, in short, makes him a murtadd. That said, the punishment for childhood apostasy is less severe than for the adult version. As Robert Spencer points out, "according to Islamic law an apostate male is not to be put to death if he has not reached puberty (cf. 'Umdat al-Salik o8.2; Hidayah vol. II p. 246). Some, however, hold that he should be imprisoned until he is of age and then 'invited' to accept Islam, but officially the death penalty for youthful apostates is ruled out." On the positive side, were Obama prominently charged with apostasy, that would uniquely raise the issue of a Muslim's right to change religion, taking a topic on the perpetual back-burner and placing it front and center, perhaps to the great future benefit of those Muslims who seek to declare themselves atheists or to convert to another religion. But would Muslims seeing Obama as a murtadd significantly affect an Obama presidency? The only precedent to judge by is that of Carlos Saúl Menem, the president of Argentina from 1989 to 1999. The son of two Muslim Syrian immigrants and husband of another Syrian-Argentine, Zulema Fátima Yoma, Menem converted to Roman Catholicism. His wife said publicly that Menem left Islam for political reasons—because Argentinean law until 1994 required the president of the country to be a member of the Church. From a Muslim point of view, Menem's conversion is worse than Obama's, having been done as an adult. Nonetheless, Menem was not threatened or otherwise made to pay a price for his change of religion, even during his trips to majority-Muslim countries, Syria in particular. It is one thing to be president of Argentina in the 1990s, however, and another to be president of the United States in 2009. One must assume that some Islamists would renounce him as a murtadd and would try to execute him. Given the protective bubble surrounding an American president, though, this threat presumably would not make much difference to his carrying out his duties. More significantly, how would more mainstream Muslims respond to him, would they be angry at what they would consider his apostasy? That reaction is a real possibility, one that could undermine his initiatives toward the Muslim world. Jan. 7, 2008 update: For a follow-up to this article, please see "Confirmed: Barack Obama Practiced Islam." In it, I reply to a challenge to the above analysis from Media Matters for America. The article also spurred several hundred comments by readers. Apr. 29, 2008 update: I provide a streamlined version of the above, with more evidence, at "Barack Obama's Muslim Childhood." May 12, 2008 update: Edward N. Luttwak picks up on my theme above in his article today in the New York Times, "President Apostate?" Writes Luttwak: "As the son of the Muslim father, Senator Obama was born a Muslim under Muslim law as it is universally understood. It makes no difference that, as Senator Obama has written, his father said he renounced his religion. Likewise, under Muslim law based on the Koran his mother's Christian background is irrelevant." He concludes that Obama's election "would compromise the ability of governments in Muslim nations to cooperate with the United States in the fight against terrorism, as well as American efforts to export democracy and human rights abroad." Comment: This goes further than I argued above, where I only suggest the "real possibility" that his religious background "could undermine his initiatives toward the Muslim world." Implied is the real possibility that it will not. It is much too early to know for sure. Aug. 28, 2008 update: For a listing of my research on this topic, see "Bibliography – My Writings on Barack Obama's Early Years as a Muslim."